Allergy Patch Test available at no charge. A: Eyelash extensions are single hair-like fibers applied to each individual lash. They add curl, volume, and fullness to your natural lashes. A: Eyelash extensions last 2-3 weeks before a client needs to come in for a fill. A single extension can stay on an eyelash for up to 2 months. A: Fills are similar to getting your nails filled in at the nail salon. When the extensions grow out during a fill, we add new extensions to make them full again, as well as removing any that look like they are growing out. Do eyelash extensions damage my natural lashes? A: No, if done properly by a trained professional. The extensions are adhered to your natural lashes and will grow out naturally with your natural lash. When a lash sheds a new one grows in its place in a continuing lash cycle. Should I come in early? A: Yes, plan to arrive at least five minutes early. This gives you the chance toget comfortable and address any questions or concerns with your lash artist. A: Your first appointment will generally last 90-120 min. During lash extension appointments, your eyes will be closed the entire time. This is your time to take a midday nap! Can I customize the look I want? A: Yes, eyelash extensions are customizable. Who would have thought? 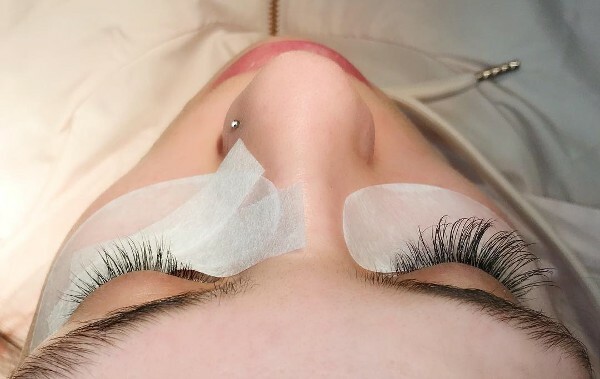 There are many different lengths, curls and diameters of eyelash extensions as well as different looks that can be created. Try a more natural look the first time. Unless you want to look like Kim Kardashian, it’s best practice to go with a natural look your first time. You can always add more drama at a later appointment. How often should I come back for fills? A: Maintenance is easy. We suggest a fill every 2-to-3 weeks. If you want them to last longer, be careful about how much you touch and rub your eyes. You should also brush them a couple times a week with the spoolie brush your lash artist sent you home with. A: Yes, you CAN get them wet. That’s good news for all the water babies out there. Just wait the recommended 24 hours before you get them wet. And after that? Shower, swim, work out, whatever. A: You CAN wear makeup. The best part of extensions is you can ditch your mascara and eyelash curler and cut your beauty routine time down, but that doesn’t mean you CAN’T wear eye makeup. If you love a winged eyeliner or a smokey eye, go right ahead and rock your look. Just make sure you are using something oil-free to take it off. A: They’re not permanent! If you want to take a break from your extensions there are two ways to do it — have them taken off or let them come off naturally. Removal takes only take a few minutes. Due to the amount of time required to perform Eyelash Extensions we require a NON REFUNDABLE deposit to hold the appointment. The deposit will be applied towards your service. If you need to move your appointment, please notify us 48 hours in advance to avoid losing your deposit.